One of the biggest obstacles to getting hired right now is the lack of understanding on the part of job seeker’s regarding how hiring is being done. Below is an informative article from FlexJobs, helping you learn what topics you need to dig in on and master for a successful job search. First, companies are more flexible with work arrangements than ever before. If you have been looking for that opportunity that gives you the opportunity to work remotely or alternative work hours, you are more likely than ever before to find that situation. Many companies are moving to a mostly, if not 100%, remote workforce to reduce overhead. In addition to the benefit of flexible work arrangements, many companies are offering unique benefits to appeal to, and retain, top candidates. Think anything from gym memberships to box seats for spring training games. Next, we see many hiring managers building a pipeline of candidates and going back to that pool as positions open. As a candidate this means you want to act with grace throughout the hiring process – especially if you were passed over as first choice. Also, be particularly open to non-traditional communication. We are all hyper-busy, including over-burdened hiring managers. Be prepared for text and social media messages in lieu of more formal communications. Finally, because it is a competitive market, you can expect more pleasant handling by hiring managers. Remember, they are building their talent pipeline. As much as you need to make a good impression, so do they. With the ever-increasing dependence on automated tracking systems, hiring managers are learning to better populate keywords to pre-screen potential candidates, saving them valuable time – which they are now using to manage your hiring process experience. For every job seeker candidate with an excellently crafted resume in hand this should mean a much more pleasant hiring, on-boarding and overall work experience. The process will still be lengthy, but has become more worthwhile in landing that ideal work situation. 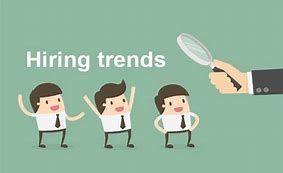 Happy reading -> https://www.flexjobs.com/blog/post/new-hiring-trends-job-seekers-be-aware/ .